The LXmini+2 was designed to render sound recordings with clarity, neutrality and with detailed, 3D-like imaging, when properly set up. The speakers will reveal what is in a recording, but never add unpleasantness. You will get lost in the music and have a big smile on your face, guaranteed! 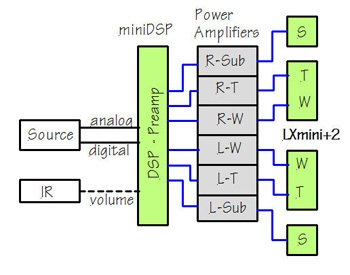 The LXmini+2 is a 3-way loudspeaker, which can be built DIY from a Kit for around $1800, including a miniDSP 4x10HD equalizer/crossover. Additionally, 6 power amplifiers in the 50 W to 200 W range are needed. 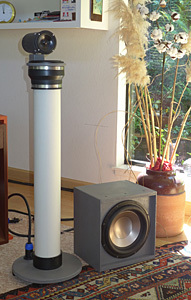 The speaker's frequency range extends from 25 Hz to 20 kHz. The horizontal and vertical off-axis frequency response, which is heard via the room, is spectrally neutral. Thus, listening off-axis merely changes the viewing angle to the phantom acoustic scene rendered by the seemingly absent loudspeakers. 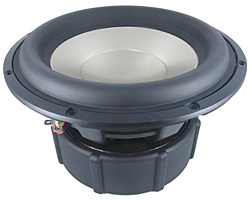 With an LR2 crossover at a low 60 Hz the two subwoofers can be placed next to or against the side walls of a room. Path length differences to the listener can be compensated for in the DSP unit. 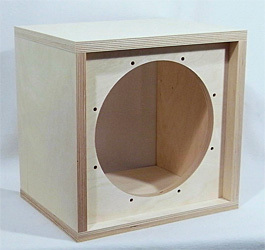 Dipole woofers can also be angled to reduce room mode excitation and thus preserve articulation in bass sounds. 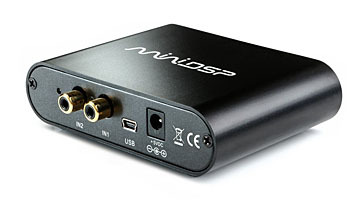 The LXmini+2 performs sonically like the LX521.4 and comes close to the full-range dipole's ultimate refinement of sound presentation, though at 10 dB reduced volume levels in the bass. 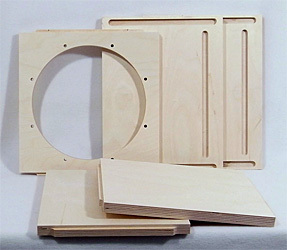 Plans/License is also required to purchase kits and assembled systems. 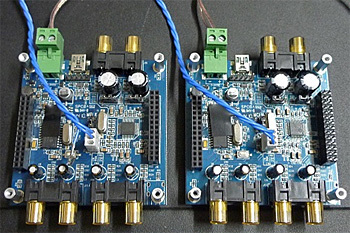 The Emotiva A-800 8-channel amplifier could be a low cost, satisfactory performance solution for LXmini, or LXmini+2, or LXstudio applications. 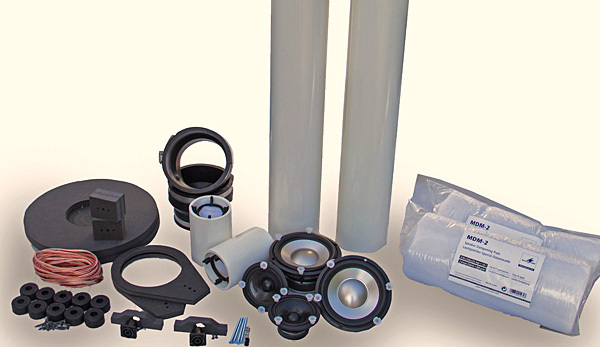 Upgrades available on request: transparent tubes, lacquered tubes, etc. Includes high-end DSP, preamp and 4 power amps from Hypex. PowerBox 6pro NCore .... "All in one" solution. The PowerBox 6 pro NCore is a preamp with volume control, a 6-ch DSP with 6ch-DAC, feeding 6 NCore amplification channel (power amplifier) in one slim but massive powder-coated aluminum top with brushed stainless steel front plate. Optimized, fully balanced internal system layout, allowing shortest signal traces, minimizing losses and artifacts. Filter programming for LXMINI; LXmini+2 or LXstudio, LX521.4: Includes remote volume control. An additional PowerBox 6pro NCore (Follower, €2490 ) allows upgrade to LX521.4 operation. PowerBox 6pro NCore .... €2490 . "All in one" solution. 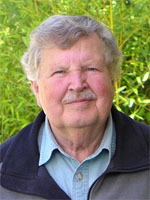 0 . "All in one" solution. Includes high-end DSP, preamp and 6 Ncore power amps from Hypex. Remote volume control. For future upgrades...an additional PowerBox 6pro NCore (Follower, €2490 ) allows upgrade to LX521.4 operation. 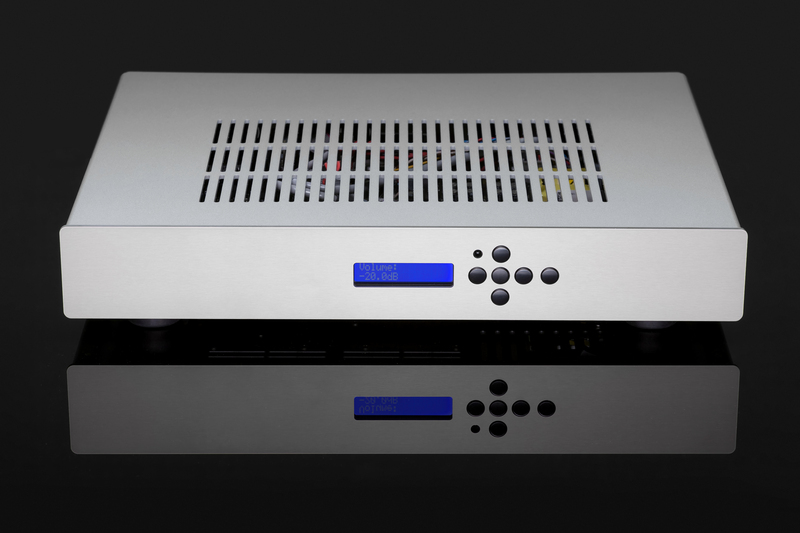 The PowerBox is a preamp with volume control, a 6-ch DSP with 6ch-DAC, feeding a 4-channel power amplifier in one slim but massive powder-coated aluminum top with brushed stainless steel front plate. 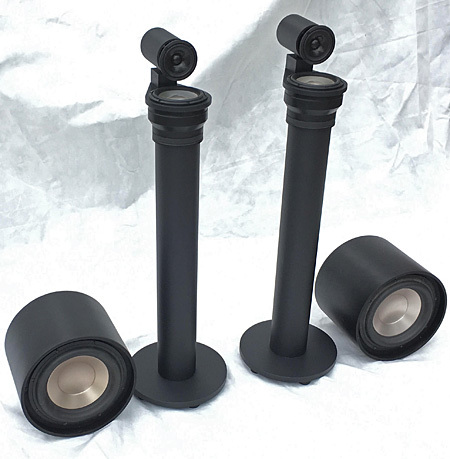 Dull black lacquered HDF parts and tubes, capless tube mount, screwless fullrange mount. Alternatively, with transparent acrylic glass tubes. Individual lacquering schemes upon request. 1x PowerBox 6pro NCore .... "All in one" solution. Send proof of Plans/License ownership to <plans@magicLX521.com>, if already bought. 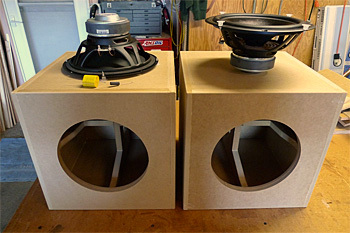 LXmini, LXmini w/Subs, Orion4d turnkey systems.